Forgot Windows local administrator password? People often find themselves locked out of their Windows operating systems as a result of a lost password for the administrator account. Usually people consider the system a lost cause and start rebuilding it. However, you can use the following tip to work around this problem. In this tutorial I’ll show you how to reset local administrator password in all versions of Windows, in case you forgot the admin password or you are locked out of your computer. How to Reset Local Administrator Password in Windows? Download the Reset Windows Password utility, which comes as an ISO image. Unzip the download file, you’ll find the ResetWindowsPwd.iso file. Burn the ISO image file to a blank CD or USB stick using any CD-recording freeware: ISO2Disc or BurnCDCC. Insert the password reset CD or USB stick into the target computer whose local administrator you want to reset. Set the computer to boot from the CD/USB. To do this you need to set CD or removal device as the first boot device in computer BIOS. After booting from the password reset CD/USB, it will launch the Reset Windows Password program. 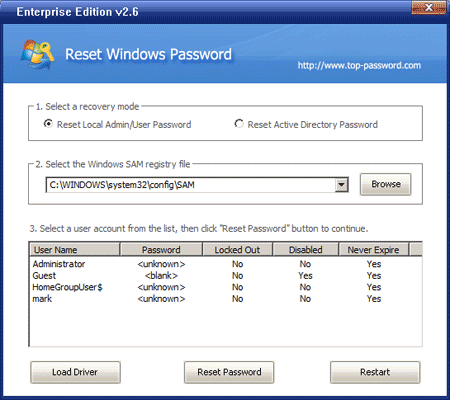 Click on the Reset Local Admin/User Password option, the program will display a list of Windows local user accounts inside the SAM database. Select the local administrator account and then click on the Reset Password button, it will remove your forgotten local admin password immediately. With the created password reset CD/USB, you can reset local administrator password on Windows 8/7/Vista/XP/2000 and Windows Server 2008/2003/2000, including 64-bit operating system. This article will show you how to reset Windows administrator password (for Windows XP, Vista and Windows 7) at times when you forgot it or when you want to gain access to a computer for which you do not know the password. Most of us have experienced a situation where we need to gain access to a computer which is password protected or at times we may forget the administrator password without which it becomes impossible to login to the computer. So here is an excellent password recovery trick which you can use to reset the password or make the password empty (remove the password) so that you can gain administrator access to the computer. You can do this with a powerful Windows password recovery software – Reset Windows Password. This utility works offline, that means you need to shutdown your locked computer and boot off the computer using a CD or USB flash drive. The tool has the following features. Most Windows operating systems store the login passwords and encrypted passwords in a file called sam (Security Accounts Manager). This file can be usually found in the directory of \windows\system32\config. This file is a part of Windows registry and remains inaccessible as long as the OS is active. Hence it is necessary that you need to boot off your computer and access this sam file via boot. Reset Windows Password utility intelligently gains access to this file and will reset/remove the password associated with administrator or any other account. Once you download you’ll get a bootable image which you need to burn it onto your CD or USB flash drive. Now boot your locked computer from it and follow the screen instructions to reset the password. Reset Windows Password can be used to reset lost local administrator/user passwords and change forgotten domain administrator/user passwords on all Windows systems. What do you do when you forgot Windows administrator password? Most of computer users end up reinstalling Windows and lose their data as well. Forgetting your Windows administrator password can leave you without access to your system, or worse. This could happen out of honest forgetfulness, the result of idiotic roommates with nothing better to do, or any number of other situations that could result in a total loss of access to your system. Thankfully, being locked out doesn’t mean you can’t regain control through some Windows password recovery tools. In fact, all you really need is a CD/DVD or USB thumb drive for creating a Windows password reset disc. Just sit back and watch the step-by-step video guide below, learn how can you reset Windows administrator password in just a few minutes. Depending on the access level applied to your son’s account, he may / may not be able to see any other accounts listed on the system. In his case, the access level is low enough that Windows 7 will not display any other user accounts. before the work, prepare a blank CD/DVD or a USB drive. 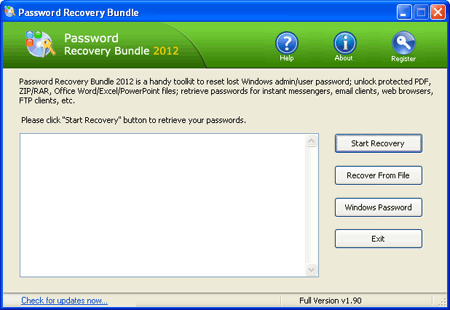 Then install and run Password Recovery Bundle on your computer, and you’ll get the interface as follow. Insert a blank CD, DVD or USB drive into the computer, and click on the Windows Password button. It will prompt a ISO Burning dialog. Choose your prepared disc and click Start Burn button, you’ll get a bootable Windows Password Reset Disk. Boot your locked computer. When it is powered on, check the boot-screen for setup key (i.e. DELETE key, F8 key, F2 key) to enter BIOS Setup Utility.Use the arrow keys to select the BOOT tab, then change the Boot Device Priority: Set 1st Boot Device to CDROM or Removable Device. Press F10 to save your changes. Insert the Windows password reset disk you’ve created into the locked computer. Restart the computer. The computer will load the Windows password reset disk. 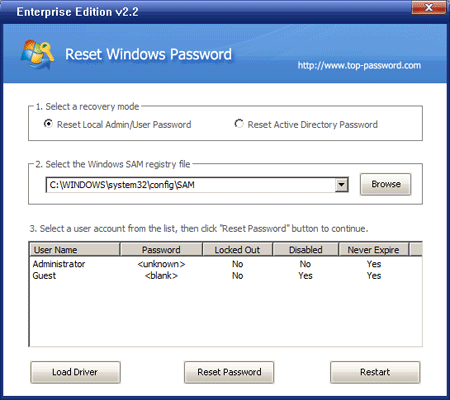 Once it launches the Reset Windows Password program, you can see Windows SAM registry hive and all user accounts available on your computer. Choose the administrator account and click Reset Password button. The program will reset your forgotten administrator password immediately. The last step is to take out of the Windows password reset disk and restart your computer. You’ll find that the computer doesn’t ask you for any password, and you can log on to Windows successfully. To set a new password, make sure that it’s a safe password and you’ll never forget it anymore.